Tired? Irritable? Need more energy? Then, you me be experiencing Adrenal Fatigue. Adrenal fatigue could affect you in many different ways including, ADD and ADHD, thyroid problems, and much more. 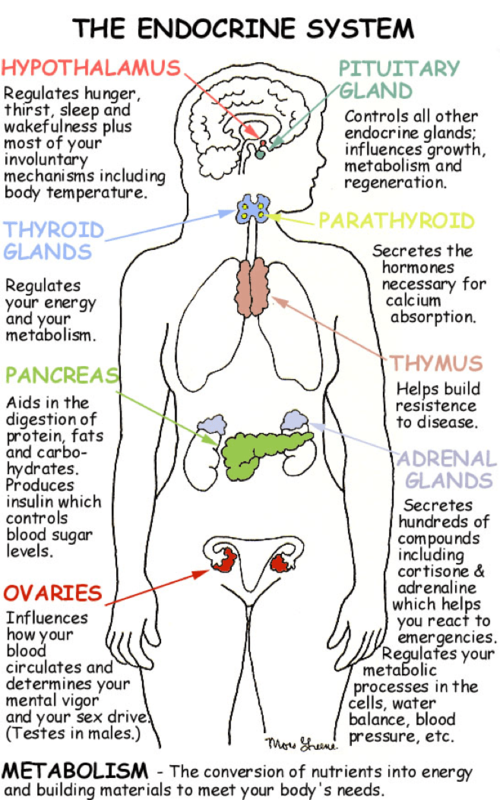 In this article I will share some of the science behind taking care of our adrenals. In particular, we will explore the relationship between adrenal fatigue and dietary protein. No Yolking™ provides a key source of dietary protein and offers many health benefits including adrenal stability. The Red brain, or Limbic system which supports a variety of functions including emotion, behaviour, motivation, and reading whether a situation is safe or not. It operates beneath the threshold of fight or flight, scanning the environment looking for safety or danger. We see a generation of higher aroused (inflamed) Red Brain. When the Red Brain is aroused the slightest thing will trigger fight or flight. It takes over the Blue Brain. When stress or stimulants like caffeine, or an immunological response to hidden food allergies, trigger the adrenals to produce adrenaline and cortisol, we (should) get hyper focused with the “fight of flight” mechanisms, geared up and ready to go. The problem is we keep putting ourselves in this state that generally does not require the body and mind on full alert and the adrenals then have to work hard again to calm the system down. The constant pumping out of these hormones, followed by norepinephrine, trying to calm the system drain the organs of their stores with little to no time to rest and recover. Likely a precursor to Addison’s Disease. When a hormone is released, it is absorbed into the blood to be carried throughout the body. Often, our glands get triggered to produce yet another hormone to affect other organs in our body. Many people experiencing adrenal fatigue also experience some degree of decreased thyroid function. Most of these test are done by way of taking blood, urine or saliva samples and tested in a lab. Diagnosing Adrenal Fatigue from a single test or symptom is impossible. To make an accurate diagnosis, doctors and naturopaths need to look at a range of tests, sometimes conducted multiple times, and take note of every symptom. This requires experience and a thorough knowledge of the various systems in our bodies, as well as some patience too. It may require two or three visits to the doctor before you can be sure that you have Adrenal Fatigue. Testing for Adrenal Fatigue can take several forms. First we have the standard hormone tests, which include testing for cortisol and various thyroid hormones. These are the tests that your medical doctor will likely give you. Then we have the tests more frequently used by integrative doctors or naturopaths – these tend to look at the ratios of various hormones and neurotransmitters, in order to get a better idea of how a patient is feeling. Lastly testing of more subjective physical tests, which were mostly developed in the early days of Adrenal Fatigue diagnosis. Stress hurts the adrenals. We can define stress as anything which challenges our survival, joy, prosperity, security or stability. It is anything which forces our system to adapt (e.g., change of circumstances, temperature, chemistry as in a sudden change of supplements, medication or even change of diet). Infection, lack of sleep or even lack of love are stressors. 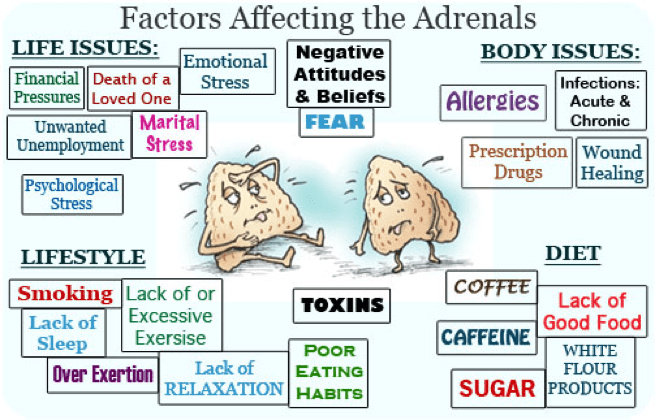 The opposite of stress such as joy, sleep and rest, comfort, peace, security, stability, and good nutrition, are examples of things that help the adrenals. Avoid the stressors and seek out those things that help. Eat more proteins (especially amino acids) and fats (not vegetable oils). Avoid stimulants and physiologically stressful substances such as caffeine, diet pills, alcohol, cigarettes, etc. If you have allergies, avoid the allergens – common allergens are wheat and dairy. Although this may sound surprising, we actually tend to crave foods to which we are allergic. 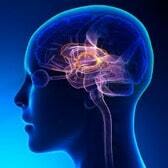 Metabolic activity (the chemical processes and changes going on in our body) represent a stress. At a level that can be handled by the adrenals, this stress is good for us (Eustress) and maintains life. If metabolic activity is too strong for the adrenals (e.g., excessive thyroid stimulation), it is at a level that is unhealthy (Distress) and wears the adrenals down. Don’t forget that stress is not just mental, it quickly jumps to be a physiologic effect. When the brain perceives stress, it sends both chemical and nerve signals to the adrenal glands ordering them to make two short-term stress hormones, epinephrine and norepinephrine and the long-term stress master hormone cortisol. Getting low blood sugar also spike cortisol levels. Cortisol is now known for promoting the dreaded stress-gut that gives chronically stressed people that apple shape. significant impact on work stress levels. significant impact on stress levels. number one factor that affects their stress level. the level of stress in their everyday lives. The costs are immeasurable when we factor in all the different aspects of this syndrome. Mostly to the individual themselves as in loss of work and quality of life by stage four. Most treatments are not covered by insurance. Such as Chelation and vitamin therapy and aids to help calm kids sometimes labelled with ADHT..